Peter has worked in areas of social justice for 40 years. A consummate networker, he is constantly looking to find ways of bringing people and organisations together. Trained as a gardener, he then worked with disabled people and disability rights organisations in Africa and India. 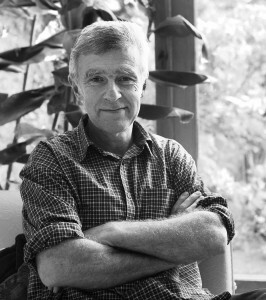 His work with Comic Relief over the last 20 years has focussed on grants assessing and most recently supporting ways to reduce the impact of climate change on poor people. Back home, he founded Sustainable Frome and is a Director of Frome’s new Renewable Energy Co-op. Recycling, reusing, organic, growing, cooking, grandfathering and bicycling are all central to his activity, and Peter’s wife Annabelle and children Ben and Amy are also all variously engaged in creating a more sustainable future. Independents for Frome (IfF) was created to support a group of individuals to stand and get elected to Frome Town Council in 2011. Ten of the seventeen who stood were elected. This gave IfF an outright majority on the council that allowed a raft of ambitious ideas to be implemented much of which is described in Flatpack Democracy. Independents for Frome had 27 people wishing to stand in 2011 and selected 17 all of whom were elected – with every seat heavily contested. They are now engaged in an even more ambitious programme for Frome. One of the keys to their success is that the group operate a ‘Way of Working’ . This enables them to make decisions in the best interest of Frome, while not emulating the Party Political system that they feel is counter-productive at Parish/Town level. 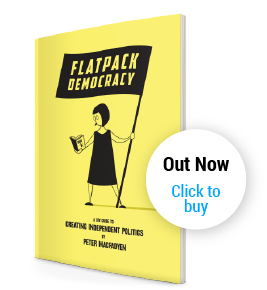 More details of the Way of Working and other aspects of their success can be found in our book Flatpack Democracy. By operating broadly as normal people do in normal everyday life, they have taken the opportunities presented by Localism whilst looking for ways to change, for the better, the relationships between people and those they elect. Peter served as Mayor of Frome from 2014/15 and gave mayrdom some new things to think about in an effort to break down barriers between officialdom and the people. He then spent a slightly frustrating year as Leader of the Council before focussing energy on widening the reach of independent thought – speaking widely to groups of potential revolutionaries – and the work of the Town matters committee which focusses on the community. You can visit IfF’s website by clicking here and the new Indie Towns website (an independent group of people wanting to promote Independent Politics) by clicking here. Peter’s view on Independent Democracy are well captured here.